Screenwriter and script doctor Douglas J. Eboch ("Sweet Home Alabama") presents a comprehensive guide to all aspects of the craft of screenwriting. 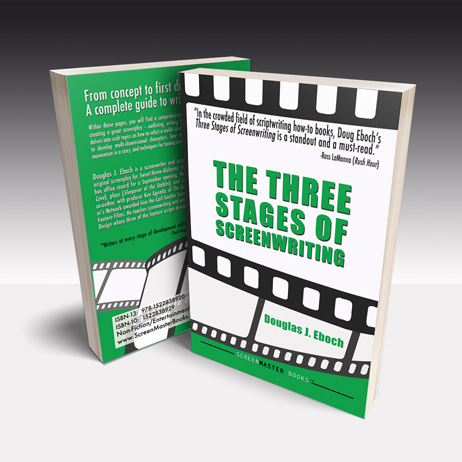 This book covers the three distinct phases of creating a great screenplay – outlining, writing the first draft, and rewriting. Doug delves into such topics as how to select a viable idea, how to structure a compelling plot, how to develop multi-dimensional characters, how to craft powerful scenes, how to build momentum in a story, and techniques for honing and shaping a professional caliber screenplay. "What Doug does so beautifully is break down the entire process of developing an idea, outlining it, writing it, and rewriting it into digestible chunks. The book is structured the same way your writing process should be, and it covers every topic you could possibly want covered under the umbrella of the writing process." "Writers at every stage of development will be delighted Doug wrote this book. I, however, am pissed off. Doug has covered so much so well that it's going to be harder to write one of my own." "A fresh and comprehensive take on screenwriting informed by Doug’s successes in the marketplace— highly recommended!" "An excellent guide to the ins and outs of screenwriting... practical, informative, and smart."